please review the camera after 4.4.1 :) thank you. After reading/watching many reviews on smartphones for the the past 5 weeks, I think I'll settle with this phone (32 GB version). My number one choice was the Samsung Galaxy Note 3, but after visiting the BEST BUY and physically holding that phone, I've decided to reconsider. MaxSmarties, 07 Dec 2013Fandroid never die ... Lol, give me an example of a low spec android smartphone doing well ... moreLmfao...Now the ifan scapegoats their fanboyism in order to make up more illogical trolling. MaxSmarties, 07 Dec 2013Since when overclocking a chipset is "full potential" ? And doing that ONLY during ... moreOverclocking??? Any android smartphone to compete with an iPhone need a more highly clocked chipset, most of the time with 4 or 8 cores, double the ram ... and in some application still lags behind (not to speak about cheating on Samsung part just to try to catch up in synthetic benchmark). Anonymous, 07 Dec 2013Yeah. The chip running at full potential on a benchmark to show the full potential is so horri... moreSince when overclocking a chipset is "full potential" ? And doing that ONLY during synthetic benchmark is the clear demonstration of the cheating (otherwise it will run at "full potential" with every app). I'm not going to explain thermal capacity to someone that isn't listen / want to know ... But your beloved Samesung just can't run at "full potential"
1. How is the loudspeaker when watching movies of hearing to songs. 2. How is the loudspeaker when talking on the phone on speaker mode. MaxSmarties, 07 Dec 2013Actually it is better in every aspect. iPhone 5s don't need pumped up specs just to run the o... moreIfans will never die out. Nor will they ever stop bringing their jealous illogical rants to other pages. With lack of a higher res display, lack of customizing, file management, diversity, full multi tasking, and true functionality it has no capability of needing the better hardware. Does anyone have half the brain to come up with a new lie at least to try troll with???? You know what is funny? You talking about cheating and the overly praising Apple in your next comment. AnonD-142950, 19 Nov 2013wow why are apple fanboys claiming the iPhone 5S is better. Sorry to bust your bubble its not.... moreActually it is better in every aspect. iPhone 5s don't need pumped up specs just to run the os smoothly, like typical Android phones. iPhone 5s is performing on par or even better with half the cores and almost half the frequency (and RAM). Using a smartphone is not about staring at a specs list. Using a smartphone is all about USER EXPERIENCE , so who cares about tech specs if the final result is even better ? Very interesting how in the performance section you speak about "optimizations" on Samsung/LG/HTC typical Android phones while it is CHEATING. No more, no less. 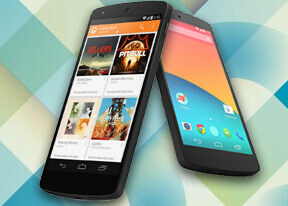 Kudos to Google to show REAL WORLD performance in Nexus 5, unless playing dirty to compete with Apple like others did. Or atleast the camera sections. well i got rid of my Nexus 5. could not cope with the dire battery life. does not even last a full day. shocking. you need to charge very regularly. shame its a good phone and got a lot to offer. speed is lightening. AnonD-142950, 27 Nov 2013okay gsmarena. not having a user replaceable battery is not a major wow. You guess been compla... moreSo because companies get away with it makes it ok? So stealing money, hurting people, and being crooked is all ok....if you get away with it? this is an awesome phone. the battery is dire. a charge every day. the camera is ok. nothing spectacular. but there is good news. an update will be on its way soon. to iron out those niggles mainly camera and battery. Shame but those aside. your rewarded with a fast and spectacular phone. gaming is like nothing else. it launches games instantly no lag. I cant wait for the update. then it will be perfect on par with LG G2. BHUPPI, 25 Nov 2013wht about resale value ..?i am good thanks, and you? Edgewood, 22 Nov 2013I'm in the market to buy a new phone and currently doing research. Watched vids on YouTube com... moreLG doesn't prepare fixes for this phone, Google does. Apparently the speaker, and the camera is a software issue, and lately Google is preparing APIs to fix them in recent leaks. okay gsmarena. not having a user replaceable battery is not a major wow. You guess been complaining about that for a while. If it really was such a amazing then why does most devices are non-removable battery. So obviously no one cares.